The 24-year-old German threw the ball into Real forward Karim Benzema and it bounced back into the net for the opening goal. Loris Karius pictured during last night's Champions League final. 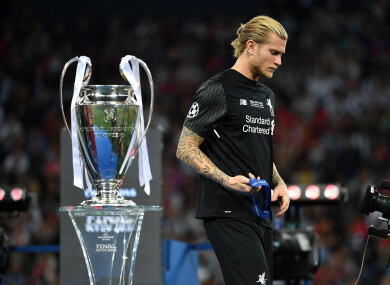 POLICE ARE INVESTIGATING after Liverpool goalkeeper Loris Karius was subjected to death threats and vile abuse on social media after his costly mistakes condemned his side to a painful Champions League final defeat against Real Madrid. Karius was at fault for two of Real’s goals in their 3-1 victory over Liverpool in Kiev on Saturday. He then allowed Gareth Bale’s harmless shot to squirm through his hands for Real’s third goal in the closing minutes. Karius was in tears after the final whistle and Liverpool manager Jurgen Klopp admitted he felt bad for the player he signed from Mainz in 2016. No Liverpool players went to console Karius, who was pictured covering his face while disembarking the team’s plane when it arrived back at John Lennon Airport on Sunday morning. Karius had apologised after the match for his mistakes, but that didn’t stop furious Liverpool fans from making sick threats to the keeper and his family. Posts included a commenter saying he hoped Karius died of cancer, while another read: “I hope your whole family dies” and one even said “I’ll murder your girl”. A spokeswoman for Merseyside Police told the Daily Telegraph that officers were investigating the abuse. “The force takes social media posts of this nature extremely seriously and any offences identified will be investigated,” she said. By the time he returned home on Sunday, Karius was still in turmoil as he tried to come to terms with his woeful display in the biggest game of his life. Without making reference to the abuse, he took to Twitter himself to again say sorry for his nightmare performance. “Haven’t really slept until now. The scenes are still running through my head again and again. I’m infinitely sorry to my team-mates, for you fans, and for all the staff,” he tweeted. “I know that I messed it up with the two mistakes and let you all down. “As I said I’d just like to turn back the time but that’s not possible. “It’s even worse as we all felt that we could have beaten Real Madrid and we were in the game for a long time. “Thank you to our unbelievable fans who came to Kiev and held my back, even after the game. Email “Police probe Karius death threats after Champions League misery”. Feedback on “Police probe Karius death threats after Champions League misery”.